If you’re anything like me, then you probably have a hefty list of foundations you want to try (Too Faced’s Born This Way, I’m coming for you next). The only problem is that finding your right foundation shade is essential, and choosing wrongly can make the purchase a total waste of money. The obvious thing that you’re mean to do is to get matched, whether that’s popping into Boots and swatching it on your skin yourself or going to a makeup counter and having the assistant match you. However, unless you live in one of the big cities, you probably don’t have every single makeup brand at your disposal. 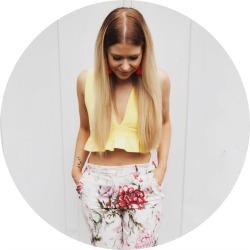 Here in the party town of Coventry, for example, I can find all of the classic brands like Estee Lauder, Clarins and YSL, but if I want NARS, MAC or Too Faced then I’ll have to go further afield to places like Leamington or Birmingham. One word: FAFF. The other option is to do your research online, and scour blog reviews for swatches and recommendations. This is perfect for lipsticks and blushers, but as we know the range of foundation shades out there is so bloody massive that finding a blogger with your exact skin tone who’s reviewed your exact desired shade is pretty slim. A lot of bloggers give their MAC shade as a reference point, but if like me you’ve never been matched in MAC (NC-what now?) then this isn’t too useful either. BUT THERE IS NOW AN ANSWER. A couple of months ago I came by a website called Findation.com. I wish I could remember how I heard of it, but as I can barely remember what day my bins go out most weeks the chances of recalling this are slim. Anyway, Findation claims to be able to help you find your foundation shade in one brand based on a shade you’ve used in the past with another. So if you know what shade you are in Rimmel 25 Hour Foundation then you can find your match in Benefit Hello Flawless. I thought it sounded amazing but was a little sceptical, so as I was after NARS Sheer Glow at the time I made the journey over the Space NK in Leamington and got matched properly. A couple of weeks ago though, I was after a new foundation and had decided to try Estee Lauder’s Double Wear. I have an Estee Lauder counter in Coventry and so decided to put Findation to the test. 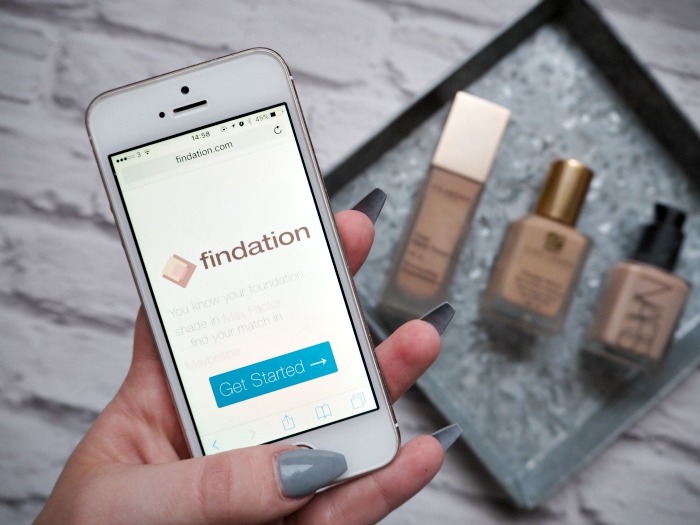 It’s really simple to use – you go to the website and input the details of previous foundations you’ve used and what shade you were in them. It will match you if you put in just one previous brand, but promises more accurate results if you list a few different shades. It then returns a HUGE list of foundations, suggesting what shade you will be in each and every one. I’m certainly no makeup expert, but it seems to include every brand I could possibly think of, from high-end Chanel, Laura Mercier and Illamasqua to drugstore favourites Bourjois, Sleek and L’Oreal. Based on the information that I entered on my previous shades in NARS Sheer Glow and Clarins Everlasting Foundation, the site advised me that I would be 2N1 Desert Beige in Estee Lauder’s Double Wear. As I was forking out £30 for this foundation, I wasn’t just going to take that as gospel and so went along to my local counter. I mentioned that I thought I was Desert Beige but wasn’t sure, so the assistant got it out for me to try. And LO and BEHOLD, it was the perfect match. I went back to Findation to find out how this sorcery works, and apparently they have just collected loads of data on the foundation shades that people wear, and then used an algorithm to work out which ones are similar across brands (I say ‘just’ as if I too could use an algorithm – I can’t even use rhythm). It does advise that if you can only provide your shades in sheer foundations then it might not be able to give you an accurate match in full coverage and vice versa, so that’s something to bear in mind if you’re looking for a completely different formula. The other handy thing is that as well as advising you of your shade, Findation then also links you to places online where you can buy it (which is how they make their money, I assume). Now that I’ve put it to the test, I think I’ll definitely put my full faith in the service next time I need to match myself quickly and easily. By the way, I know that it’s quite unusual for me to rave about one thing like this so much – miserable Negative Nancy that I am – and so just in case anyone’s wondering if this post is sponsored or in any way influenced by Findation, I’d like to confirm that it is 100% NOT. I genuinely stumbled across it myself, was impressed and so decided to spread the word to help other people out. I know, I deserve an OBE really. Have any of you used Findation before? Let me know in the comments! I have tried Findation as well, and was impressed, the only problem is when you want a fairly new foundation there is only limited data available. It works best for old favorites. thank YOU! ive always wanted to know what shade i am for makeup forever, will have to try now. Thanks again!!! Living in a small city myself, I know the struggle of buying makeup products without being able to swatch or try them first! This app sounds amazing and I’ll definitely be giving it a try! This sounds brilliant. I hate the fact that you can’t try on drugstore foundations on your whole face, so I’ll have to give this a go to find the perfect match! Gosh, this sounds fantastic! We don’t get huge brand counters here, too, so I’ve never actually dared to purchase any foundation that I WANT because I’m so afraid of purchasing the wrong shade. This seems to solve all the problem, though. Thanks for sharing, Claire! 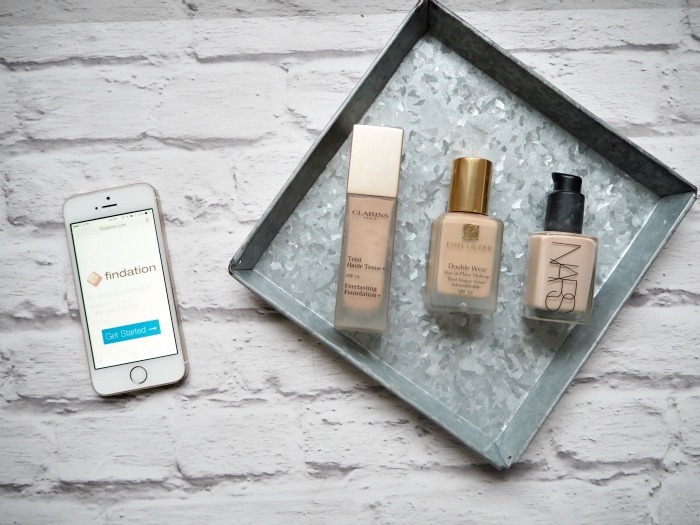 I love using findation whenever I’m shopping for foundations online and so far it has never failed me! Especially when I have the perfect foundation shade and I want to find a similar shade but with a different formula. Whaaat!? 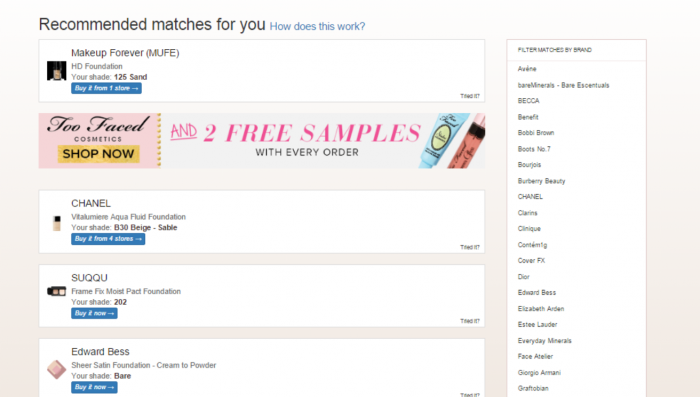 I wish I had known about this before I placed my order for the bourjois foundation! (luckily it suits me!) but I was super worried that it wouldn’t. Whoever came up with this is a genius and I can’t thank you enough for spreading the word! I am definitely going to take a look now! I am so grateful for this, finally found something to help find my shade! So glad, thank you so much! This has changed my life. You are my hero.